Prawns are wonderful when grilled, taking no more than 5 minutes to cook. Select large, raw prawns for grilling, as these will stand up to the heat and can be skewered and turned easily during cooking. You can marinate the prawns prior to cooking, this will add more flavour. This technique is particularly prevalent in Indian cuisine, as demonstrated by Alfred Prasad’s Kalonji jhinga. When skewered and cooked on the barbeque, the charcoal imparts a wonderfully smoky flavour into the flesh - perfect served simply alongside a squeeze of lemon to enhance the prawn’s natural sweetness. 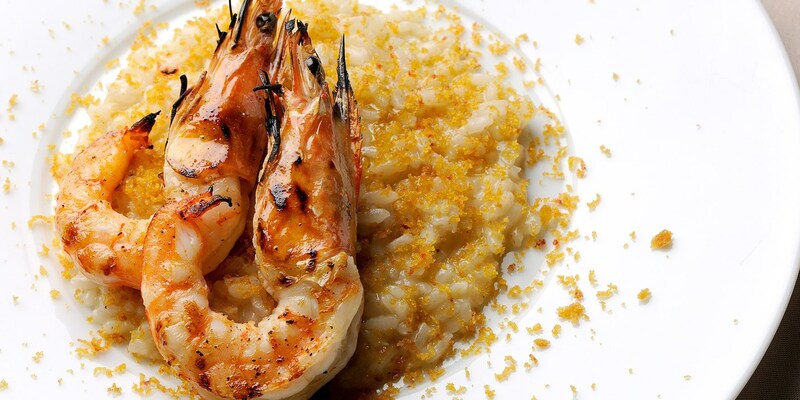 Pascal Aussignac serves grilled prawns with risotto, enhancing with pungent bonito flakes and poutargue.